I always carry my phone when I take our rambunctious puppy for a walk. Like all my dogs, he has learned to stop for photographs. He sniffs. I shoot pictures. What follows are a few flowers we found on our walks this past spring. #1-From our yard. 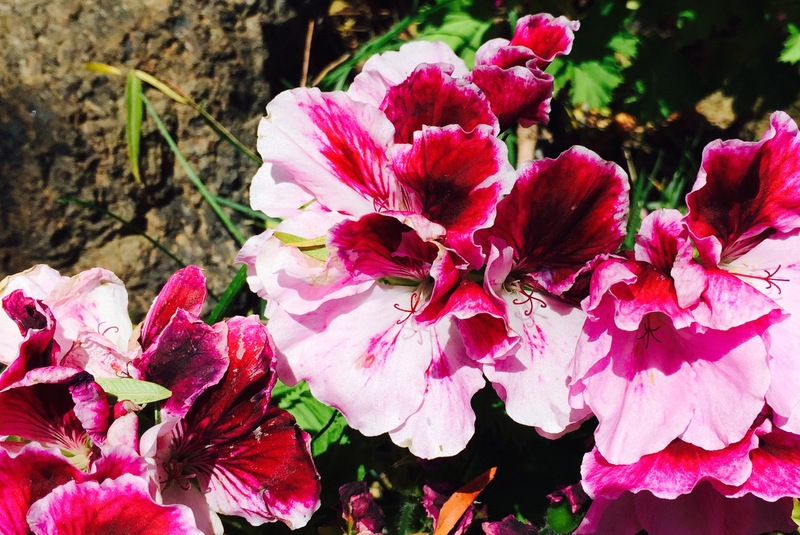 Geraniums handle our heat and clay soil with grace and beauty. 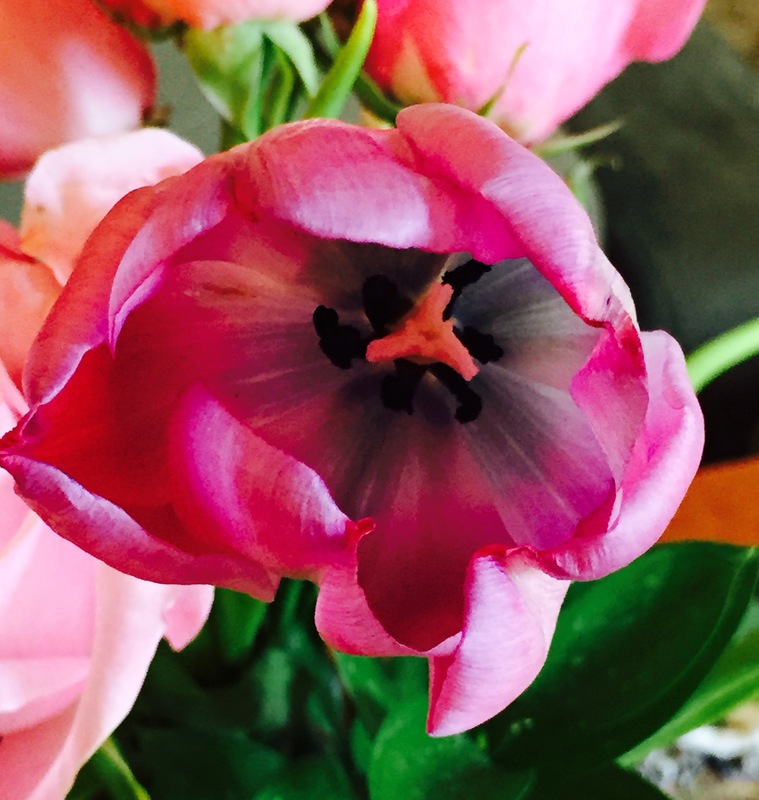 #2-Tulips spear their way through our soil and give us daily spring surprises. 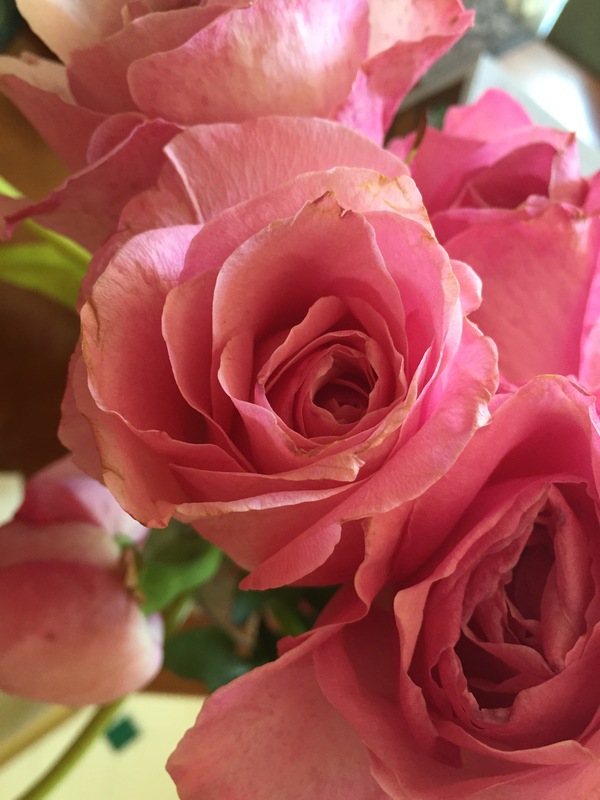 #3 & #4- A neighbor’s roses made glorious models for my iphone flower mission. 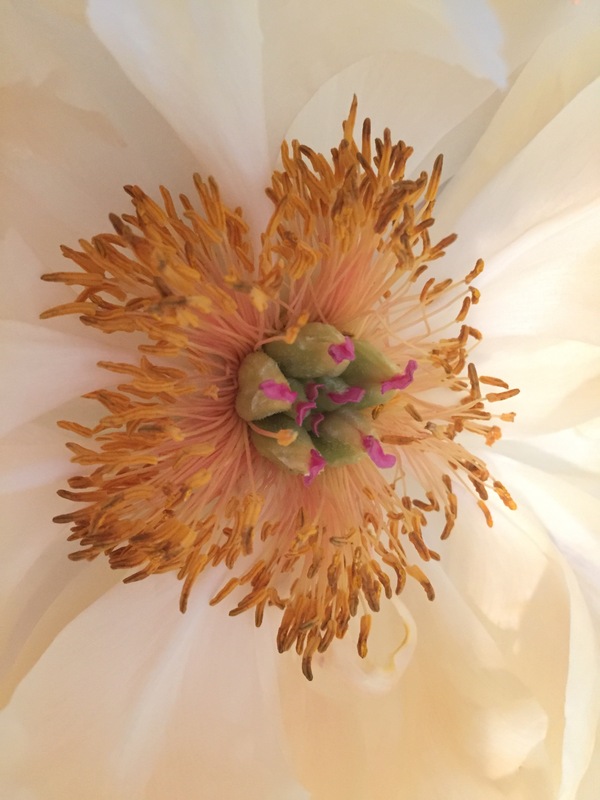 #5-The center of a peony my husband brought home to brighten our weekend. 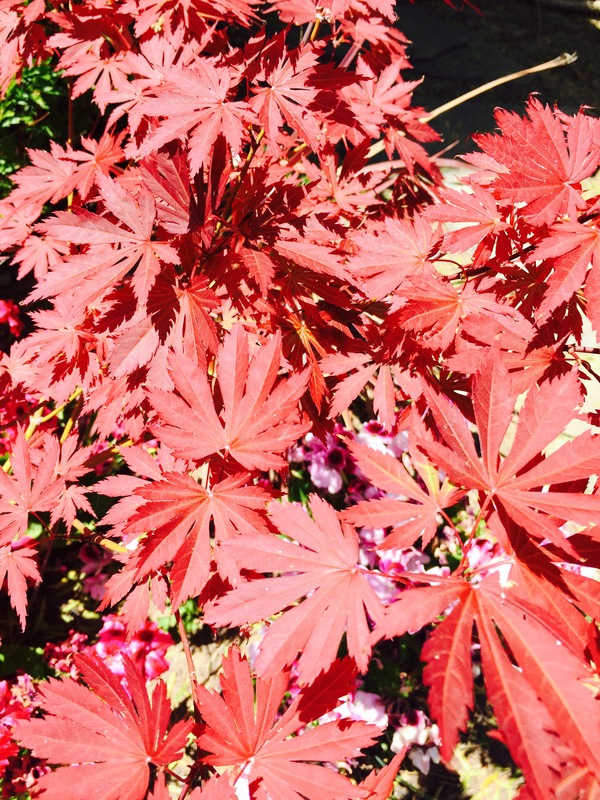 #6-The leaves of our Japanese maple alive & well. I will post a follow up of what damage the drought has wrought to these vibrant leaves. This entry was posted in Dogs, Photography, Puppies and tagged dogs, flowers, photography. Bookmark the permalink. L-O-V-E, love this! As a gardener, floral designer, and lover of all things nature, this post resonated within my peony-shaped heart. Thanks, Jan! 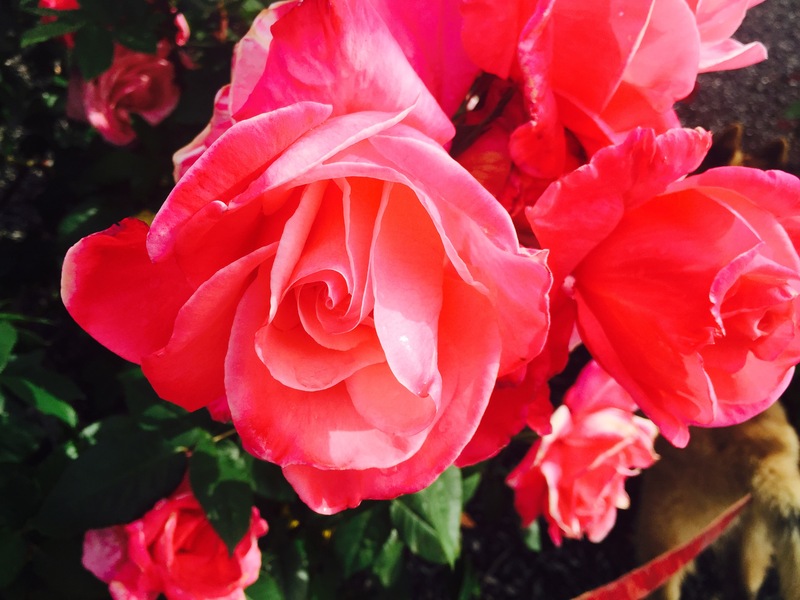 Keep stopping to smell the flowers… and photograph them! Thank you for your wonderful comment. You made my day. My grandchildren are all older so I walk with my ‘child.’ To encourage your wonderful participation in their lives, I encouraged them all to notice small things and to create images. The oldest is finishing his degree in film school as a director and he is a professional photographer. His senior project is a short film on a poem he wrote. (Which Bamma said was just asking to be a film.) The next one down is going to a special university for graphic design and animation and has been drawing and writing since he could hold a pen. The girl, also just starting university, blows me away with her poetry. And of all the delights a Sudanese girl rescued from foster care writes and I love encouraging her. Know that you’re molding their futures and as you know grab every minute! Jan P.S. Their are three more grandchildren but I’ll stop now.